An aide-de-camp (UK: /ˌeɪddəˈkɒ̃/, US: /-ˈkæmp/; French expression meaning literally helper in the [military] camp) is a personal assistant or secretary to a person of high rank, usually a senior military, police or government officer, or to a member of a royal family or a head of state. An aide-de-camp may participate at ceremonial functions, and the first aide-de-camp is typically the foremost personal aide. This is not to be confused with an adjutant, who is the senior administrator of a military unit. In some countries, aide-de-camp is considered to be a title of honour, which confers the post-nominal letters ADC or A de C.
A controversy was raised in 2006, when president Néstor Kirchner decided to promote his army aide-de-camp, Lieutenant Colonel Graham to colonel, one year ahead of his class. Upon taking office, former president Cristina Kirchner decided to have, for the first time, female officers as her aides-de-camp. In Belgium the title of honorary aide-de-camp to the King can be granted by the royal court for services rendered. Notable people include Major General Baron Édouard Empain, Count Charles John d'Oultremont, and Lieutenant General Baron Albert du Roy de Blicquy. 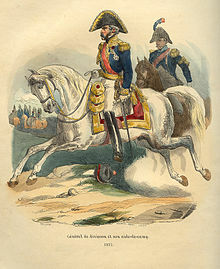 An aide-de-camp, according to an 1816 military dictionary, was defined as an officer appointed to attend a general officer, and was traditionally seldom under the grade of captain: "The King may appoint for himself as many as he pleases, which appointment gives the rank of colonel in the army. Generals being field marshals, have four, lieutenant generals two, major generals one". In British colonies and modern-day British overseas territories, an aide-de-camp is appointed to serve the governor and, later, the governor general. These aides were mostly from military branches or native auxiliaries. They were entitled to use letters ADC or A de C after their names. The emblem of the office is the aiguillette worn on their uniform. Most aides-de-camp wear a gold pattern aiguillette when acting in their official capacity; however, members of St. John Ambulance Canada wear silver aiguillettes consistent with their other accoutrements as aide-de-camp or as a symbol of ceremonial representation such as a member of the honour guard or a position of command on parade. All aides-de-camp also wear the cypher or badge of the principal to whom they are appointed. Honorary appointees to the Queen (royal cypher), to the Duke of Edinburgh, or the Prince of Wales, wear the appropriate cypher on their uniform epaulette and are entitled to use the post-nominal letters ADC for the duration of their appointment. Aides-de-camp to the governor general wear the governor general's badge (crest of the arms of Canada) and aides-de-camp to a lieutenant governor wear the lieutenant governor's badge (the shield of the province surmounted by a crown). They are appointed from officers of the Canadian Forces. Aides-de-camp to lieutenant governors are appointed from officers of the Canadian Forces, Royal Canadian Mounted Police and, depending on the province, aides may also be appointed from other uniformed organizations such as municipal or provincial police and emergency services. In certain instances, civilians may be appointed. 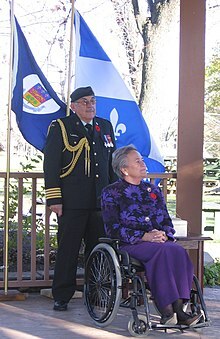 Non-uniformed civilians do not wear the aiguillette, but do wear their lieutenant governor's badge as a symbol of their appointment. On 29 November 1973, Governor General Roland Michener concluded his initiative to permit aides-de-camp to the governor general and lieutenant governors to use the post-nominal letters A de C for the duration of their appointment. A presidential aide-de-camp can be seen to the left of President Ram Nath Kovind, who has just administered the oath of office to Indian chief justice Dipak Misra on 28 August 2017. As in other Commonwealth countries where the Queen is head of state, personnel from the New Zealand Defence Force serve as aides-de-camp to royal and vice-regal personages. The governor-general of New Zealand has two full-time aides-de-camp of the rank of army captain, lieutenant RNZN or RNZAF flight lieutenant. Additional and honorary aides-de-camp to the governor-general are of the rank of lieutenant colonel or equivalent. Aiguilettes are of the standard palace No. 1 type and worn on the right shoulder. Equivalent appointments also serve the minister of Defence, the chief of Defence Force and service chiefs. These are usually known as military assistants (MA) personal staff officers (PSOs) or, in the case of the RNZN, flag lieutenant (flags), and wear service-specific No. 2 aigullettes with coloured flecks (dark blue for navy, red for army and light blue for air force) on the left shoulder. In Pakistan the President, Prime Minister and Governors have their own aides-de-camp. The aide-de-camp can be from any one of the three Armed Forces and typically are of the rank of captain (army), lieutenant (navy) or flight lieutenant (air force). The aide-de-camp to Justice Khan Habibullah Khan, while he was chief minister and leader of the house of West Pakistan, was his son, a senior bureaucrat, Captain Akhtar Munir Marwat and Captain Gohar Ayub Khan was to his father, President Field Marshal Ayub Khan. The Chairman of the Joint Chiefs of Staff Committee and all the three service chiefs are authorised to have an aide-de-camp. In Pakistan, officers of the rank of major general and equivalent and above in the sister services who are in command of divisions or of peacetime commands have aides-de-camp who usually belong to their general's parent regiment/battalion. As in other commonwealth realms where the Queen is head of state, the governor-general of Papua New Guinea has two full-time aides-de-camp. One is from the Papua New Guinea Defence Force and one from the Royal Papua New Guinea Constabulary of the ranks of PNGDF Captain and RPNGC Superintendent. In Singapore, the President appoints aides-de-camp from the armed services as well as officers selected from the police force and civil defence force. These officers usually hold the rank of major or military expert 5 in the armed services or major in the Singapore civil defence force, whereas an assistant superintendent of police is chosen from the Singapore police force. Both male and female officers may serve as aides-de-camp. In Sri Lanka, the president has aides-de-camp from the three armed services as well as extra aides-de-camp. All general, flag and air officers have their own aide-de-camp, usually selected from their parent regiment or unit. In the navy, an aide-de-camp is called a flag lieutenant. Junior officers of the rank of major and below serve as aide-de-camp, appointed only if they have completed three years of commissioned service. Officers appointed as an aide-de-camp or extra aide-de-camp can serve a maximum of three years, with the exception of those serving the president. Once an officer completes a term of service as an aide-de-camp or extra aide-de-camp, the officer can not be reappointed to a similar position for another two years. Medical officers of the rank of lieutenant colonel and above can be appointed as Honorary Physician to the President or Honorary Surgeon to the President. On 8 August 1992, Major General Denzil Kobbekaduwa (Overall Operations Commander - Northern Sector) and his aide-de-camp Major Nalin S. De Alwis, were killed along with several senior army and navy officers when their Land Rover hit a land mine off Araly Point in Kayts. On 16 November 1992 the Commander of the Sri Lanka Navy, Rear Admiral Clancy Fernando and his flag lieutenant, Lieutenant Sandun Gunasekera, were assassinated by a LTTE suicide bomber who drove an explosives laden motorbike into the admiral's staff car in front of the Galle Face Green. In 2006 the Commander of the Sri Lanka Army, Lieutenant General Sarath Fonseka, and his aide-de-camp Major Priyal Wickramasinghe were seriously wounded in a LTTE suicide bomb attack by a pregnant LTTE operative on the general's staff car inside Army Headquarters. The President of Tanzania has an aide-de-camp from the Tanzania People's Defence Force, with the rank of Kanali (colonel). There are several categories of these senior aides-de-camp to the Queen, which entitle the aide-de-camp to the post-nominal letters "ADC". Most are serving army, navy, and air force officers, usually of colonel or brigadier rank or equivalent. There are also specific posts for very senior officers, such as first and principal naval aide-de-camp, flag aide-de-camp, aides de camp general, and air aides-de-camp. Analogous offices include the Lieutenant of the Admiralty, the Rear Admiral of the United Kingdom, and the Gold Stick and Silver Stick. Certain members of the Royal Family with military rank may be appointed personal aides-de-camp to the Queen. Those currently holding this appointment are HRH The Duke of Kent; HRH The Prince of Wales; HRH The Duke of Cambridge; HRH The Duke of York; HRH The Earl of Wessex; HRH The Duke of Sussex and Vice Admiral Sir Timothy Laurence. In addition, when wearing a military uniform, HRH The Duke of Edinburgh wears the insignia of a personal aide-de-camp to the Queen's father, King George VI. 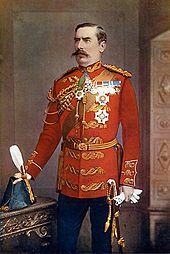 Aides-de-camp and equerries (along with certain other officers) are distinguished by the addition of aiguillettes to dress uniforms, which differ in size, colour and position of wear, depending on the appointment. In addition, aides-de-camp to the monarch wear the monarch's royal cypher on their shoulder straps in various orders of dress. A distinctive and elaborate full dress uniform used to be worn by army aides-de-camp, but its use was largely discontinued after World War I. Lieutenant colonels and colonels commanding units (battalions and brigades, respectively) do not have aides. Occasionally, the unit's adjutant – called the S-1 – will assist the commanding officer as an aide but this is uncommon. Since a General of the Army does not retire and remains an officer of the United States Army for life, he or she is entitled to an aide of the rank of colonel. The military aides to the President number five (one from each of the armed services), and they are majors and lieutenant colonels (in the Army, Marine Corps and Air Force). Navy and Coast Guard military aides to the President hold the rank of lieutenant commander or commander. One of their major roles is to hold the Presidential emergency satchel. There are, in addition to these five permanent aides-de-camp, some 40–45 military social aides, who are more junior (lieutenant to major) and are temporary officers whose appointment is, as their titles suggest, for social purposes (primarily as hosts at the White House). They are part-time, required for perhaps 2–4 afternoons a month. ^ James, Charles (1816). An Universal Military Dictionary, in English and French (4th ed.). London: T. Egerton. p. 8. ^ a b Canada Gazette, 9 February 1974. ^ a b Canadian Forces Administrative Order 3–4. ^ a b c Canadian Forces Publication 265. ^ "Styles of address – Others". Canadian Heritage. ^ "Staff Pay Tribute to Late Sir Michael Ogio". Post Courier. Papua New Guinea. ^ "103 honorary aides-de-camp appointed". Channel NewsAsia. Archived from the original on 2013-06-08. Retrieved 2013-05-24. ^ "Sri Lanka Army Officers Service Regulations" (PDF). ^ "Gen. Denzil Kobbekaduwa, who led from the front". Sunday Observer. Sri Lanka. August 5, 2007. Archived from the original on 2014-12-06. ^ "Suicide Terrorism: A Global Threat". Jane's Intelligence Review. 20 October 2000. Archived from the original on 2001-08-20. ^ Bloom, Mia (24 May 2009). "What the Tigers Taught Al-Qaeda". Washington Post. ^ "Fonseka still critical after suicide bomb attack". Tamil Guardian. Retrieved 2015-03-29. ^ "If This is Called Peace". Time Magazine. Retrieved 2006-04-30. ^ "Army Regulation 614-100, Officer Assignment Policies, Details, and Transfers" (PDF). U.S. Department of the Army. 10 January 2006. Archived from the original (PDF) on 2013-02-25. Retrieved 2013-11-19. ^ "Flag Aide". United States Navy — Navy Personnel Command. 8 August 2013. Retrieved 2014-04-04. ^ "PERS-412 Flag Aide Nomination Availabilities List" (PDF). United States Navy — Navy Personnel Command. 27 January 2014. Archived from the original (PDF) on 2014-04-07. Retrieved 2014-04-04. Lawrence P. Crocker (September 1996). Army Officer's Guide. ISBN 978-0-8117-2665-8.